Harness Magazine is a pinch of magic, a large dose of female empowerment and a whole lot of authenticity. Our community is built on the real stories and passions of women from all parts of the earth. 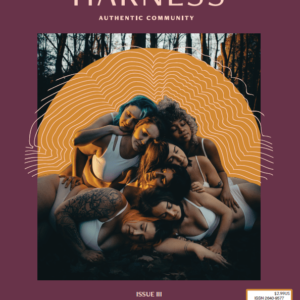 Vibrant, powerful and diverse – this issue captures the essence of Harness more so than ever. The stories, art and poetry contained within these pages are being showcased for the first time. Some of these women have never shared their feelings in this way – some have finally found the voice to say what they want to say. If there is anything I want most, it’s that this issue opens your eyes to the real human emotions that we all feel on some level. While our experiences are individual and distinct, those feelings of love, fear, longing, are universal. Issue II features women from 10 different countries and was photographed by female photographers around the country. We hope you enjoy this issue as much as we did creating it!